For example at one point he claims that global mean surface temperature is "based mainly on only 1,200 measuring stations for Earth’s entire surface". This is utter rubbish. From the GISS website, there are records from more than 6,000 weather stations used in GHCN v3, which covers land. I don't know how many are reporting currently. The chart suggests around 2,000 - maybe a reader knows. 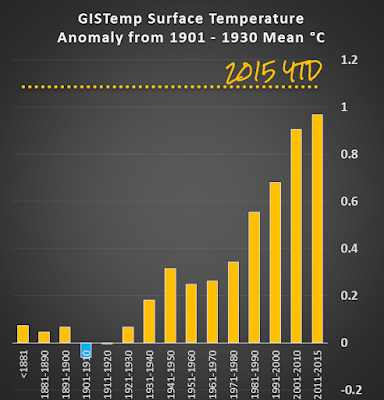 The new NOAA data set adds land data from ISTI to GHCN data, which has doubled the number of land records. Then there are all the thermometers in the oceans, mostly located on moored and floating buoys, but also ship readings. For some reason, telling lies isn't listed among the Telltale Techniques of Climate Science Denial, yet it's probably the most common technique of all. Paul commits a logical fallacy of personal incredulity (Telltale Technique No. 2), when he writes: "The “hottest ever” charade also assumes reliable temperature data exist for the entire USA and planet all the way back to 1880! It defies belief." No it doesn't defy belief, although the further back in time you go, the fewer reliable records to work with. GISTemp probably starts in 1880, not 1780, because the error bars get quite a bit larger when you go back further. HadCRUT goes back to 1850, while Berkeley Earth goes all the way back to 1750. Now that will certainly defy the belief of a science denier like Paul Driessen. Claims that 2014 was the “hottest year on record,” and July 2015 was “the hottest July” since “at least 1880,” are based on city and airport temperatures that are always several degrees higher than those at nearby rural sites. He and his friends in the UN, EU, Big Green and Climate Crisis Industry have also made it clear that they intend to use the Paris conference to negotiate the future distribution of the world’s wealth and resources, determine what economic growth and living standards are “ecologically feasible,” and transform the global economic development model: replacing sovereign nations and free enterprise capitalism with global governance and decision-making based on “sustainable development” and “dangerous manmade climate change” mantras. 1992 climate conference organizers even said saving the world requires that they cause “industrialized civilization to collapse.” They intend to keep their promises. How's that for alarmism. Not to mention conspiracy theorising. I couldn’t have said it better. Well done Mr Driessen. I will be re-posting this in as many places as I can manage. We are tired of being defrauded by those who claim to care for the planet when not caring a fig for their own people. Strong western economies mean strong worldwide trade and a demand for goods and services from the third world. With bankrupt economies everyone will suffer. It is time to throw out the UN and the EU and all other 2 letter acronyms! Pol Pot, Stalin, Mao were genocidal maniacs. I never thought, that, I would begin to categorize the aforementioned with the name of a US president but as history shows and as any numerate economist cogent business analyst, logical thinker will inform you if you start to allow governments to limit and regulate the means of production, the only outcome its names are – famine and death. There is another issue at stake, too. As Jerry Pournelle pointed out years ago, if we use our natural resources to get into space on a grand scale we can mine the solar system for eons to come. If we try to conserve these resources for the sake of conserving our resources we’ll simply run out, thereby destroying any chance of using the vast wealth awaiting us out there. Remove all government money from anything climate or environment related. Prosecute for fraud the scammers who are constantly adjusting century-old data to the fullest extent of the law. Serious jail time will greatly deter any future charlatans. great article! have tweeted Donald J. Trump asking what a Trump presidency would do to END the green madness and fraud…. and to NZ PM John Key…. NZ really needs to stop following the UN shite. Speaking of 'tired of being defrauded'... once you get passed the 'entertaining' videos, there are a few pointers about the meaning of words and the 'batshit crazies' that are running around in our midst. Uh ... but what is Anthony - a man who makes great play of the fact that he doesn't take money from the fossil fuel industry (apart from a few lapses now and then) - doing hosting crap from such an obvious corporate shill? Your selection of Prof. MeiDere’s comment about mining the vast wealth out there in space made me chuckle. The limiting factor in space resource exploitation is the availability of a prolific, low-cost, compact, inexhaustible energy source without bad side effects. And always will be. The Jerry Purnelle’s of the world seem to gloss over this aspect when writing science fiction. Prof. MeiDere, et al., ignore this when applying such visions to humanity’s future both near and long term on both Earth and in space since the same limiting factors apply to the use (and reuse) of resources. If one wants to exploit the great wealth in space, one needs a magical energy source. If one invents that magical energy source for use in space, one solves the Earth’s resource problem, as well as climate change and, wishfully thinking, economic inequality (the Star Trek premise). Is a magical energy source possible? We currently exploit the electromagnetic force (chemical binding energy) for direct generation of most of our electricity and for transformation from one form of energy to another (e.g. from binding energy to heat, to motion, to electricity, back to heat). This is not going to work pretty much anywhere in space. We do use the much more magical strong force to generate a small amount of useful energy via nuclear fission (with all its bad side effects), but by way of heat, to motion, to etc., just as we do with fossil fuels. PV and wind are other ways of exploiting this magical power source, but via the Sun. These methods are hardly compact. Nuclear fusion comes closest to the magical source, but what are there other ways to exploit the strong force? The current D-T approach to fusion is neither compact, low-cost nor side-effect free. An eventual economical ITER-type generator might end up being a kilometer on a side (3D) just for the containment chamber and cost a cool $100B each. Some posit a neutron-free Boron(11)–proton fusion reaction that theoretically has most of the qualities needed for "the magical energy source" but may be magical forever. Unfortunately, much like the WUWT crowd, there exists a proliferation of distracters (e.g. Rossi and his LENR scam) who promise magic sources derived from magical processes or the anti-nuclear anything crowd who can’t see beyond the word nuclear (albeit with some good logic). This cast of distracters plays much the same role as climate change deniers, keeping the public’s eye (funding) distracted from the facts and the way forward. So, I find it odd that the WUWTers, and especially FLDM given his comment, aren’t focused on solving (cheerleading) the “magical energy source” problem since a solution to that would solve everyone’s pet Earthly and space-borne problems besides providing the answer to life, the Universe and, well, just about everything. May the (strong) Force be with us. Aside from that, I absolutely concur with everything else that you've so well summarised. August 24 was being called Black Monday by Conservative types who were having a fit about the 4% drop in stockmarket. The scary news broadcasts were sure to mention how much the average 401(k) lost, but they're careful to tell people not get out of the stock market as it always comes back. This is a bald faced lie as it concerns managed 401(k) accounts as they always burn through a big wad of your cash even when you're making money. When the market goes down, then you really feel it. If you're stuck in one of these traps put your money into an index fund so there are fewer fees and no losses from the fund manager trying to beat the market. The last Black Monday was October 19, 1987 when the market dropped 22.6%, almost 6 times the August 24 drop. Saint Reagan was in charge then so you don't hear anyone talk about that particular Monday. Reagan was cheerleading the switch to 401(k) but they were new and the amount lost was relatively small. Reagan didn't actually invent the 401(k), but he sure thought they were swell. The tradition of defined benefit pensions was converted to simply dumping your money into Wall Street. This was great for Ronnie's corporate buddies who were getting all kinds of corporate behavior de-criminalized, and they granted him Sainthood for it as he absolved them from all their sins. Oh, sure, it's all fun and games until the black helicopters of the UN Climate Shock Troop Brigade show up over your gated community to seize your guns and SUVs and chuck you in the AGW reeducation gulags. Then you'll realize that those seeming nutters at WUWT were right, but it will be too late. I fear you've given away too much already, looʞ oɹez. The supercomputers programmed with faulty climate models also track every climate-related comment on the Internet, the Deep Web and the series of tubes. But maybe they'll look favorably on some of your past comments, and send you to one of the nicer camps. Pretty good... Oh, I'm sure there's already a bunker buster bomb with my name on it. Say, Sou, can we have a conspiracy ideation contest? Because I have a couple that will curl your toes. Would you recommend poured concrete or cinder blocks? After reading that WUWT article I've decided to pull the trigger on my long-planned bunker and that's the one detail I haven't ironed out yet. Poured... Joshua, I would rent a cabin in the Ozarks or somewhere and locate a cave on National Forest land. You can always rent one again if you're skeeered. Much less expensive. There are also underground warehouses in some areas of the country that double as bomb shelter. You can also brace up the sides of shipping containers and cover them. Joshua, when you dig your bunker underground make sure that you put bladders or bottle of water in the soil above, to absorb your infrared signature. If you're skilled you can make it look like a pool or soak to an aerial camera. And foil - you need lots of foil. Especially if there are local radio towers. Shiny side out works best. We went after monsters and created super monsters... now the solution is to make the previous monsters into Super Duper Monsters? Even if a particular place is warmer or cooler than it's surrounds it doesn't matter. What Paul doesn't know is that it's the trend that matters, not whether one place is hotter or colder than another. That is, whether the temperature in the New York region has risen or fallen over time and by how much. If (for example) New York, over a certain time, has grown in size, area, building density, building height, concrete volume, power consumption, vehicle density, and population, surely it is quite likely the temperature anomaly over that certain time would be considerably greater for New York than the anomaly of an untouched rural area over the same time period. Yes, the error in thinking is yours, marke. What you quoted relates to the particular quote of Paul Driessen's above, marke, not to a growing urban centre. As I'm sure you knew, since you had to read it to copy it. For lurkers, Paul made the dumb claim:. "Claims that 2014 was the “hottest year on record,” and July 2015 was “the hottest July” since “at least 1880,” are based on city and airport temperatures that are always several degrees higher than those at nearby rural sites.". In any case, the situation you described, marke, is provided for in global surface temperature anomalies, which you should know as well - not that it makes much difference in the context of the whole of the land and sea surface. In other words, marke, if you are trying to argue that if New York City hadn't grown last year, then 2014 wouldn't have been the hottest on record, you'd be wrong. At its simplest, a temperature anomaly is the difference between the average temperatures at one particular geographical point over two different points in time. ie, a time period in New York 100 years ago may give us a particular average temperature, whereas a similar time period more recently may give us a different average temperature, resulting in, say, a positive anomaly of 2°C. Surely some of that 2°C anomaly is likely to be due to the changes I have described above? Yes you are missing something. More than something. What you are missing is twofold. First of all, the effect of urbanisation is adjusted for in global surface temperature anomaly calculations. It's one of those "adjustments" that deniers don't want, curiously. Secondly, you are missing that this is not what Paul Driessen was arguing. Do I need to repeat (again) what he wrote? He was arguing that the record heat of 2014 was because of thermometers in the cities. That's absurd. This isn't the effect you described. Urban heat differentials don't happen only over a year. What he was arguing assumed that global mean surface temperature doesn't use anomalies. He was suggesting that it used actual temperature. And he's also wrong because there are lots of thermometers in areas that aren't affected by UHI. Not just thermometers on land, but there is no UHI effect on the more than two-thirds of the planet surface that is covered by oceans. OK, so it is as I understood it. Whether a particular place is now hotter than its surroundings does in fact matter, and needs to be adjusted for if there is likely to be a UHI component. it's the trend that matters, not whether one place is hotter or colder than another. ... and agree that UHI will have no effect on the oceans. However, if we are talking about global temperatures back to 1880, I note that ocean temperature measurements are rather sparse before 1956, then were very patchy and varied in instrumentation over the next 50 yars, until the full deployment of the Argo buoys 10 years ago. LIke I said in your quote, marke. 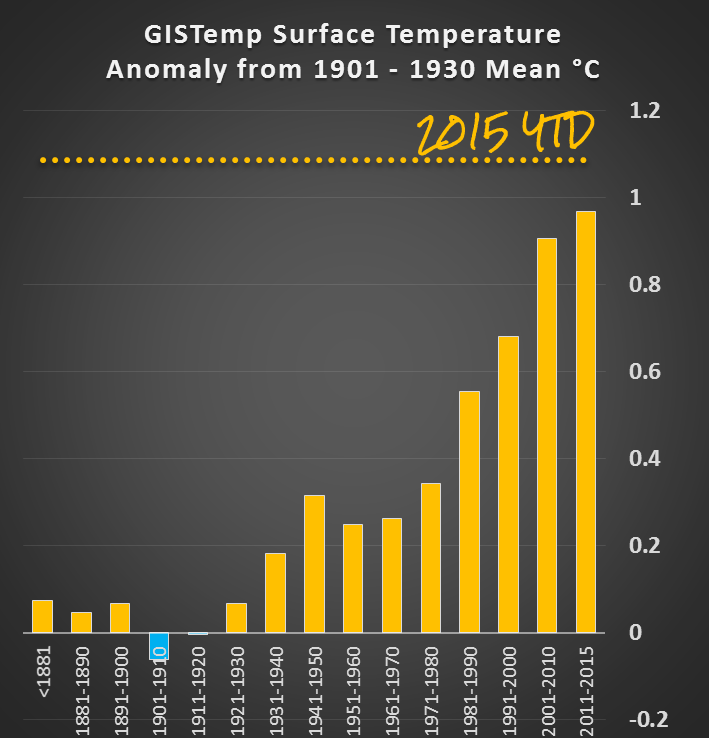 "It is the trend that matters, not whether one place is hotter or colder than another." I also see that you're reverting to form and pointing at squirrels. The point is that Paul Driessen was wrong about 2014. If you want to shift the discussion and suggest that ocean temperatures before 1956 were somehow a lot hotter than they are today, then do it on a denier blog, not here. That notion is as silly as much of what else you write. PS Do us all a favour and think before you put fingers to keyboard - and read the words on the page. Confirmation bias is a helluva thing to overcome, but it can be overcome if you try. GISTemp probably starts in 1880, not 1780, because the error bars get quite a bit larger when you go back further. HadCRUT goes back to 1850, while Berkeley Earth goes all the way back to 1750. Now that will certainly defy the belief of a science denier like Paul Driessen. And no, I am not suggesting: "....that ocean temperatures before 1956 were somehow a lot hotter than they are today, then do it on a denier blog, not here..."
I'd suggest, in regard to the instrument record, we probably don't really know one way or the other. Can't you read, marke? I said "do it on a denier blog". You might not know but scientists and all reasonable people do know. If you want to play the denier clown then this isn't the place. BTW - for lurkers, not deniers: if sea surface temperatures were as high sixty years ago and longer ago as they are now, then it would show up in land surface temperatures among other things. Scientists do know "something" not "nuffin'". BTW, personal incredulity is a logical fallacy which is Telltale Technique No. 2 of climate science denial. .... and to then turn around to say the sea surface temperature reconstructions from very sparse data must be correct ... because of the land surface temperature data...? Not at all marke. You need to read your quote in context to understand why it's not a circular argument, not try to tie it to something else altogether. Paul Driessen was claiming that global mean surface temperature is "based mainly on only 1,200 measuring stations for Earth’s entire surface". I was showing it wasn't. That there were many more records. It's got nothing to do with your silly notion that seas were as hot sixty years ago as they are today. Here's the paragraph in context. Your other point is a different issue. The sea surface temperature of the past is estimated from ship data, and can be supported by land records. There is no circular argument. They are separate issues. Without wanting to be rude, marke, have you ever thought about taking a critical thinking course? I don't know if it would help you or not. Probably depends on how set in your ways you are. stop with the red herring arguments, they are getting old. The climate people know about UHI, they are not stupid. Instead of nit-picking, be a true skeptic and show scientific evidence that the UHI is significantly affecting the temperature records, if you think there is an issue. BTW - for deniers: Urban heat island effects were documented long before the (d)evolution of the first climate science deniers. So all these marine species are extending their range northwards because of dodgy temperature measurements? I didn't know they kept up to date with the scientific journals. 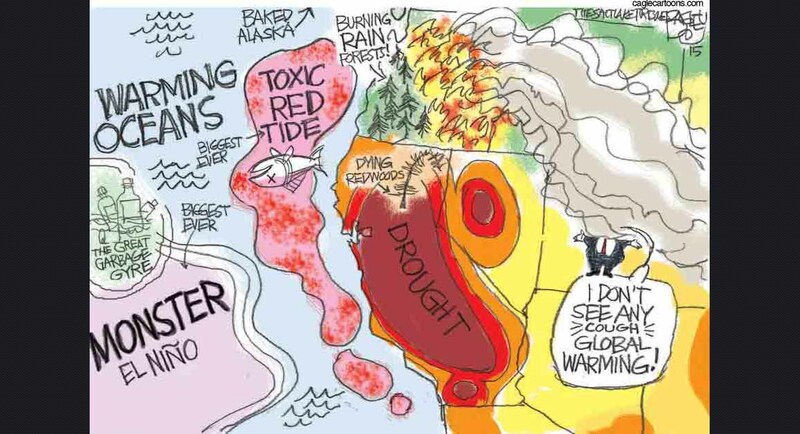 The things we learn from climate change deniers.